A pyromaniac has been unleashed on London and Holmes has to find him. George travels to a casino resort where a man was killed for his perfect “system” for winning at the casino. Click here to download, click here to add this podcast to your Itunes, click here to subscribe to this podcast on Zune, click here to subscribe to this feed using any other feed read. Frank Race agrees to meet the last request of a man on death row and retrieve a pair of baby shoes from a safe deposit box. He’s shocked to be ambushed by three armed women. 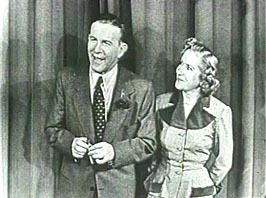 Burns and Allen remain one of the most successful and memorable husband-wife comedy teams of all time. Their performances on radio began in the mid-30s with those that were variety radio programs . The programs featured an announcer, band leader, and various character actors and the whole act was doing the show with plot contrivances thrown in usually centered on a rivals as their characters remained single even after they’d been married. These programs weren’t bad and they did show aspects of their talent that were not apparent in later shows. For example, Gracie Allen sang, and George Burns sang before entering a decade of pretending to not be able to carry a tune.They showed Gracie’s zaniness found plenty of outlets. Most famously, in 1940 on their Hormel program, she staged a run for President on the “Surprise Party” ticket while on the Hinds and Honey Almond show. However, the light banter and romantic rivalry plots just didn’t work anymore. At 45, Burns realized the couple was simply too old for it, so for the 1941-42 season for their new show on Swan, Burns and Allen became a sitcom with musical interludes. 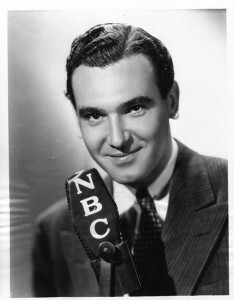 Singer Jimmy Cash and Orchestra leader Paul Whiteman still did some acting in addition to their singing, but receded into the background after the first season as far as the plot went. 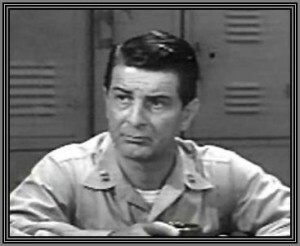 The show became a home to a variety of characters. Clarence Nash (who voiced Donald Duck) featured in the first couple of seasons as a talking pet duck named Herman, and during the Swan Years Mel Blanc would portray the happy postman whose happy words were contradicted by his dour voice tone. When the show was sponsored later by Maxwell Coffee, Gale Gordon would play a Texas Oil Millionaire, with Elliot Lewis as a manic depressive man who swung from euphoria to rage at every job he had, and Hans Conreid as a psychiatrist who was the Burns’ next door neighbor. Bill Goodwin remained the commercial spokesman, extra comic, and absurdly successful lady’s man. The highlight of course was Gracie and George. With Gracie’s unimitable style and delivery, she was to 1940s radio what Lucille Ball would be to 1950s television, relying on her zaniness and timing to create fantastic situations. George Burns was the perfect straight man for Gracie and guests with perfect pitch reactions. The couple left radio for television in 1950, but they’d left an indellible mark in their nine seasons in the sitcom format. Bob Bailey did some of his best work in relative obscurity. He performed from 1946 into the mid-1950s as detective George Valentine in Let George Do It in a series that was a West Coast only production of the Don Lee mutual network, helping to bring to life the stories of up and coming writers such as Jackson Gillis. Outside of this, his radio work up until 1955 was mostly a slew of character roles on such reliable sources of such work as Cavalcade of America and Lux Radio Theater. 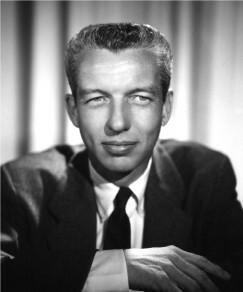 However, in October 1955, he made his most lasting mark on radio when he became the fourth on-air Johnny Dollar. The radio detective series had been on the wane as a genre for years after its heyday in the late 40s and early 50s. Long time detective franchises such as Dragnet and Barrie Craig had packed it in at the end of their 1954-55 seasons. However, after more than a year off the air, CBS re-launched Yours Truly Johnny Dollar as a five day a week serial on October 3, 1955 with Bailey winning the title role. There were many things that made the show a success, but Bailey was the key. He was the perfect Johnny Dollar. He could be tough as his Johnny Dollar predecessor Edmond O’Brien, he could be more tender than John Lund, and he could generate excitement as he told listeners what they could expect in tomorrow’s installment. While the Yours Truly Johnny Dollar scripts were often reused and expanded stories from other golden age shows of the 1940s. However, the scripts were well-expanded, and Bailey made every episode a joy. The serial format lasted for more than a year, but Bailey continued to appear in weekly 30 minute episodes for another four years before the show moved to New York with Bailey opting to stay close to his family. The series continued for 22 months, and successive Johnny Dollar actors were highly influenced by Bailey’s performance. For people who grew up in the mid-to-late 1950s, he was the radio detective as they never heard Philip Marlowe or Michael Shayne. The radio detective genre had run itself to the ground through over-saturating the market, while also competing with the rise of television. The amazing thing about Bailey’s Johnny Dollar is that despite these factors, it became a success.